– Draw a picture. Make a sandwich. Teach writing. Grace comes to work with Jane and finds the art supplies. During a scheduled hour to discuss their upcoming proposal drafts, I asked a group of 10 chemical engineering students to explain to each other their research projects, the rationale, the experimental design, and prior research. They talked productively for a half-hour and listened to each other with curiosity and asked relevant questions. All good. Certainly, we could have filled the rest of the hour with more talk. 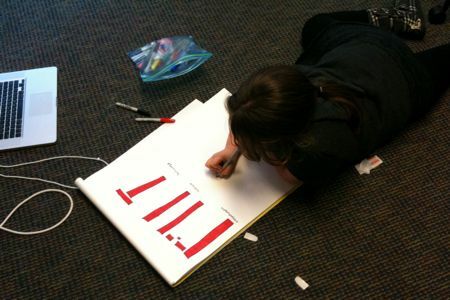 I looked at the classroom’s two white boards and one easel pad and clutch of dry erase markers and Sharpies. I invited them, instead, to draw. 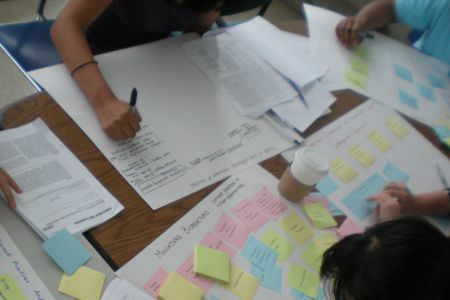 In small groups, they drew branching diagrams of their proposed experiments and explained their plans — and, even more importantly, gaps in their plans — to their peers. I walked around. They asked questions about how they might frame their experimental design in their drafts. My friend and colleague Lisa had the classroom reserved after me, and she came in five minutes before we finished. 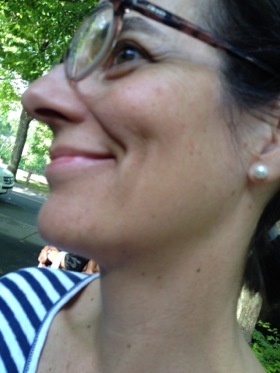 Later, on the way to the copy machine, I saw Lisa’s students (in a different section of the same class) sprawled on the floor with big pieces of white paper and clustered around the white boards, drawing and gesturing with hands and markers. I do not want to take sole credit for the diagramming exercise. In the fall, Lisa and I co-taught the communications portion of another chemical engineering class, and we deliberately used a lot of media (some electronic, some hands on) to get students to interact and experiment with scientific prose and knowledge in ways different from straight writing and talking. For example, in one meeting, we prompted the students to deconstruct a literature review article. Their tools were white drawing paper, post-it notes, Sharpies, masking tape (for students who like to work on a vertical surface), tables, and the floor. We didn’t just set them loose; we gave them guidelines for pulling apart the many aspects of the technology that the lit review focused on. ChemE students "rebuild" lit reviews on bioreactors, biofuels, and vaccines. There also was an intended outcome. After 45 minutes or so of parallel play, they would have to discuss the lit review with their research partners and develop together a schematic that could provide an overview of the technology to a person unfamiliar with it. Furthermore, they would compose a list of questions to bring to their TA and course prof that would help the students themselves understand the technology more deeply than by just reading the lit review, and stopping. Sometimes writing classes are called “workshops.” If they really are workshops, then we need to bring materials to them and tools. Yes, texts are materials and pens are tools, but there are more than those. 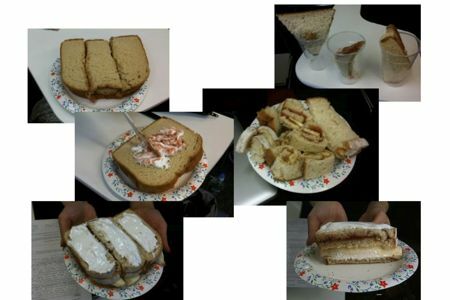 On Tuesday, in a group of 18 experimental biology students, another colleague and I put the makings of sandwiches on the table. We were introducing to the students the Materials and Methods section of a scientific paper; they were about to draft one for the first time, and this is a challenging genre to confront. It’s a record of a process (“this was done”), but many of them are used to instructions for a process (“do this, and then this, and then this”). We wanted to give them an experience of writing instructions and then rewriting them as methods. Before our mini-lecture began, Karen gave them their assignment: “Divide into threes. One of you will supervise the design of the sandwich; one of you will be the sandwich-maker; and the third person will write the sandwich instructions, like a recipe. Here’s the challenge — you have to give your sandwich a twist.” We set them loose on two kinds of bread, peanut butter, strawberry jam, marshmallow fluff, bananas, and a few plastic knives. Give them basic tools and materials, say "sandwiches," and get this. Later, after our lecture on the Materials and Methods section, which included examples, we got them to return to their sandwich protocols (“Take one slice of bread and spread it with peanut butter,” and so on) and revise them into a kind of Methods section: “A slice of white bread was plated and labeled. Peanut butter (2 T.) was spread on one side.” And so on. Of course, we had the six sandwich teams read aloud their Methods. (I loved that one ended with the strawberry jam “marbled” into the fluff.) They got the gist of it: passive voice, past tense, informative verbs, specificity, sequence. Could we have gotten them to do the same kind of writing without the concrete activity? Yes. However, what the sandwich activity accomplished, we hoped, were all those learning extras: sustained attention, motivation (fun! ), novelty, collaboration, and active hands. ← – It’s here! It’s here! Wow! These are some great ideas, Jane! I especially like the drawing one and the one with the post-it notes. I’m seriously going to think about trying some of those out in my young-adult lit class when they start working on their research papers. Since we’re talking about visual literacy in the class anyway, this would be a good way to actually bring that concept into play. What I really want to know, however, is who got to (or had to) eat those sandwiches? Rosemary, we could talk more about the drawing and post-it notes exercises when you’re ready. It’s possible I even have in my files some guidelines that we typed out. A handout! The students ate the sandwiches! Seventeen of the 18 portions (6 sandwiches x 3 portions) were eaten. The remaining portion was doggy-bagged by a student and saved for her lunch. I took the extra bread and spreads to my office, and later made myself a sandwich. No fluff.